Retention harvesting, an approach that intentionally retains legacy features such as mature overstory trees, provides options for achieving ecological objectives. At the same time, retained overstory trees may compete with the nearby recovering understory for resources, and much remains to be learned about potential trade-offs with regeneration objectives, particularly over extended time periods. 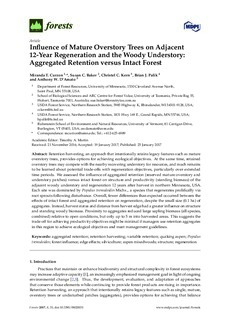 We assessed the influence of aggregated retention (reserved mature overstory and understory patches) versus intact forest on structure and productivity (standing biomass) of the adjacent woody understory and regeneration 12 years after harvest in northern Minnesota, USA. Each site was dominated by Populus tremuloides Michx., a species that regenerates prolifically via root sprouts following disturbance. Overall, fewer differences than expected occurred between the effects of intact forest and aggregated retention on regeneration, despite the small size (0.1 ha) of aggregates. Instead, harvest status and distance from harvest edge had a greater influence on structure and standing woody biomass. Proximity to aggregates reduced large sapling biomass (all species, combined) relative to open conditions, but only up to 5 m into harvested areas. This suggests the trade-off for achieving productivity objectives might be minimal if managers use retention aggregates in this region to achieve ecological objectives and meet management guidelines.